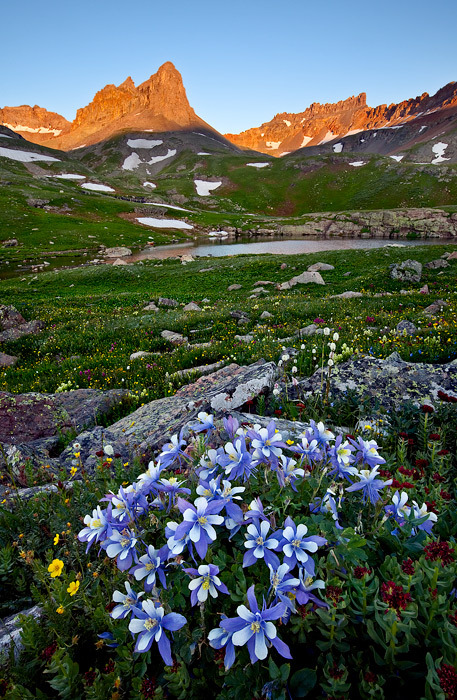 Today we are concluding my two-part series on the technical art of capturing alpine wildflowers. Let’s jump right into it and talk about some advanced techniques for creating dynamic pictures. Focus Blending to Create Depth of Field – There are many varieties of this technique available for landscape photographers and I found this one works best for me. My default area for focusing on an image is centered about one-third of the way into the frame. I’ll refocus and take the same image focused on the extreme foreground and then a third focus point and picture on the background subject matter as well. After adjusting the exposure, tone, and white balance in RAW, I’ll open my primary image in Photoshop. I do the same thing for the second image I captured, keeping the settings the same. I then copy and paste the second image into the same frame as the first one. Next, I make sure the images are properly aligned by selecting both and using the auto align tool. Keep in mind, sometimes the tool doesn’t do a perfect job on the first attempt. Zoom in close and double-check the results and rerun the tool if you aren’t satisfied. Once your images are properly aligned, use an inverse mask on the second image and brush in the parts of the image that are sharper in the foreground. Please keep in mind this can get kind of tricky when dealing with wildflowers because just the slightest breeze can cause movement in the flowers. Once you are happy with your results save the file. It is important not do any cropping yet. Next I flatten the image file into one and repeat the steps using the third image captured for the background. Normally this step is a little bit easier because there usually isn’t as much detail in the background as there is in a foreground. Once you are happy with the results you can then begin your regular editing. I prefer to save the cropping for last during my workflow. Micro Blending – Micro blending is sub category of blending for depth of field. The technique is pretty much the same as the one I just described, except you are specifically blending for one small part of the image. Let me give you an example. Suppose you completed the steps above and your wildflowers look good. You then notice a couple of errant flowers that show movement from a slight breeze. You go back and review all of your shots of the scene and because you bracketed, you find a shorter exposure that has those flowers rendered more in focus. What you can do is adjust the settings in ACR to match your current picture setting and open that image up, follow the above steps and blend in just the flowers you need. I hope this explanation of my depth of field blending techniques is useful to you. If so, or if you have any other comments or suggestions, I’d love to hear from you. Have a wonderful Labor Day Holiday. Contemporary landscape photography is dominated by digital images of saturated and vibrant color. The popularity of this style is obvious and it oftentimes overshadows the traditional and subtle effectiveness of just using black and white. However, by no means is black and white photography passe. Today, we’ll discuss some of the most important processes involved in capturing and presenting your images in black and white. 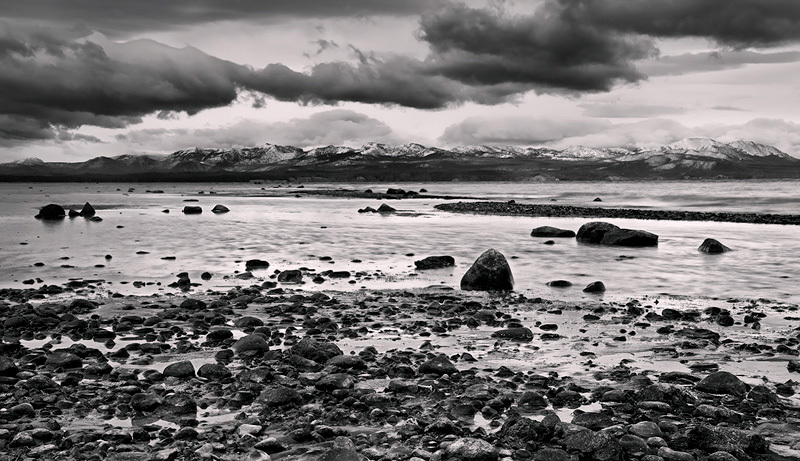 One of the most critical steps for the photographer to think in terms of black and white. What I mean is at the time of capture you should be envisioning a black and white finished product for your photograph. While this doesn’t always have to be the case, it certainly does help. You may be wondering, how does one go about developing this type of mindset? One key is for the photographer to focus on finding black and white compositions when they are in the field. A prime way of accomplishing this is through the careful examination of subject matter and light. Black and white photography is most effective when there is a full spectrum of tone between white and black with many different shades of grey. Two common means of illustration are the primary colors of the subject and/or the light during the time of capture. This is an image of Yellowstone Lake taken at the beginning of October as the area’s lovely fall weather was deteriorating into the freezing grip of winter. The water level here was low thus exposing many of the rocks in the lake. During capture, it was very cold and windy and a huge snow storm was moving in. The colors were fairly mute and because it was in the late afternoon and extremely overcast I knew this would lend well to black and white. Once again, the key with black and white is to offer the viewer the full spectrum of tones so the eye can easily differentiate between the shades. Form is also accentuated in black and white. The effective use of contrast to emphasize form is often a key to the aesthetic success of your image. Here I like the forms of the rocks in the water. I also like the powerful U-shape formed by the exposed bank in the lake. 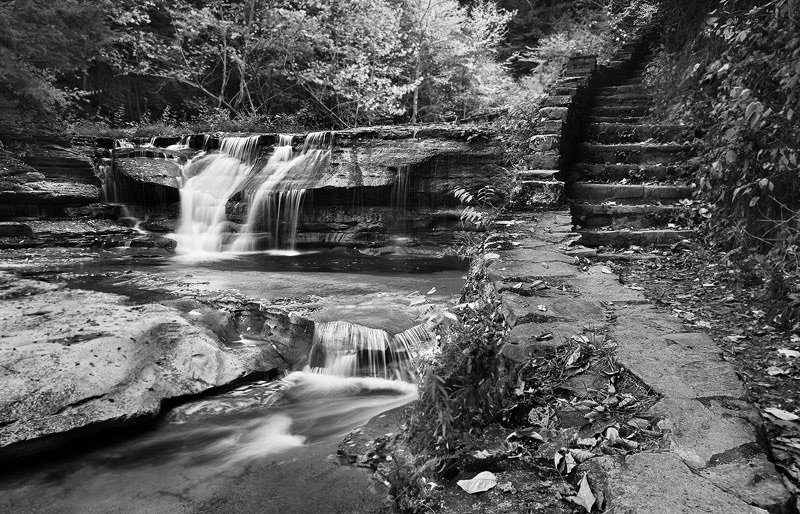 Stylistically, several types of prominent landscapes translate well into black and white photography. Here is a short list to keep in mind next time your are in the field: aspen trees, dead trees, raging creeks, sand dunes, barns, and snow capped peaks. While this blog post was not designed to get into the specific technical aspects behind black and white processing, I will briefly discuss a couple important factors. How and when you convert your image to black and white is a subjective call. I’ve experimented with it several ways and I don’t particularly have a preference. It can be done at the beginning or end of your work flow and by a number of different ways in the same programs. (There are also third party plug ins that effectively facilitate the conversion too). If you are looking to have a finished product in both color and black and white I suggest just convert and tweak at the end of your work flow, unless you want to completely edit the picture twice. For example, look closely at the image below and then compare to the one above. Notice the difference in the tone? The Yellowstone Lake shot is bluer, while the image beneath is more of a neutral grey. Hopefully this post provided you with a little creative inspiration and approach to capturing and presenting your images in black and white, until next time have a great weekend!